I have probably one of the BEST illusions I’ve ever run across for you today! 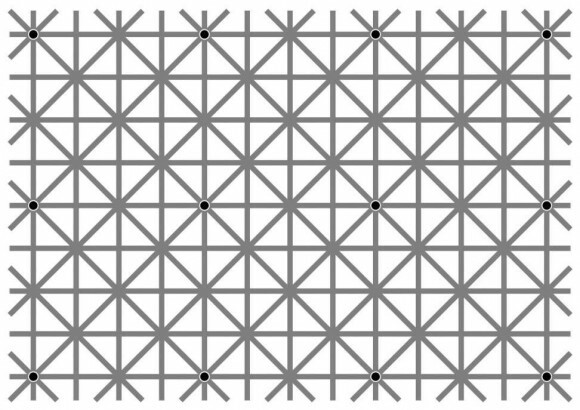 This black dots illusion is taking the Internet by storm lately. It is pretty awesome and it really makes you think…and go a little batty at the same time! Check out the image below. There are actually 12 black dots in the image below, each on one of the intersecting gray lines. Chances are, you can probably see some of the black dots. But, not all at once, right? When you focus on one black dot, the other ones seem to disappear, at least for most people. It may seem like some sort of magical sorcery, but there really is a good explanation for it. Our peripheral vision is not that great. Seeing something like a little black dot in a sea of gray lines is pretty difficult. Basically, out brains are filling in the areas where the other black dots are based on the repeating pattern of the gray lines. This black dots illusion is definitely pretty cool, but do you remember when this hidden cell phone image was all the rage? Next Duckmato and Duckgetables Family | Fun With Vegetables! Ive seen many illusions where the dots appear and when you look at the they disappear. This is a great reversed version.